Sometimes referred to as "sleep" or eye matter, eye discharge that appears in normal consistency upon waking is a typical part of your body's defense mechanisms, protecting your eyes from bacteria or other irritants. Eye discharge that appears in abnormal consistency, color, or quantities might be a sign of a more serious condition and should be brought to the attention of an eye care profession right away. Abnormal eye discharge usually indicates an underlying condition -- sometimes bacterial, viral, or allergy related. One of the most common causes of abnormal eye discharge is conjunctivitis (pink eye), which refers to the inflammation of the conjunctiva (the lining of the underside of the eyelid and white of the eye). Conjunctivitis occurs due to contagious bacterial and viral infections as well as allergies. In addition, conditions such as ocular herpes, Acanthamoeba keratitis, blepharitis, and styes also lead to excessive or abnormal eye discharge. Some issues which are not infectious can lead to abnormal eye discharge as well. These include chronic dry eyes, a blocked tear duct, sensitivity to contact lenses, an eye injury, and a corneal ulcer. If a bacterial or viral infection is present, symptoms such as body aches, chills, fever, sneezing, and/or coughing might accompany the above-mentioned eye symptoms. A change in normal eye discharge alone or accompanied by any of these symptoms should be brought to an eye care professional’s attention, as it is usually the sign of a more serious underlying problem. Eye care professionals diagnose the cause of abnormal eye discharge by looking at the patient's medical history and performing an eye exam. If a corneal ulcer is present, the eye care professional will likely test a sample to determine whether or not an infection is present. 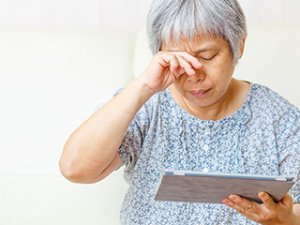 Treatment for abnormal eye discharge depends on the diagnosis of the underlying cause, and might include oral antibiotics, antibiotic eye drops, antihistamines, or antihistamine eye drops. To alleviate symptoms at home, eye care professionals often recommend using a warm, wet compress.